Discount codes can not be applied to this product. * Unfortunately, we can not allow discounts on this item as it is very costly to import into Canada. *due to the size and weight of this item, it does not qualify for free shipping. The cost to ship this item within Canada and the US is $18. Please choose the 'Canada Post - heavy item' as your shipping method if you are having this item shipped. If the actual shipping amount is less than $18, you will be refunded the difference. If you live in Vancouver or Metro Vancouver and are having this pillow shipped, please select the 'Flat $7 Rate within Metro Vancouver' shipping method. ** and due to the high shipping cost of bringing these pillows into Canada, they can not qualify for any discount. 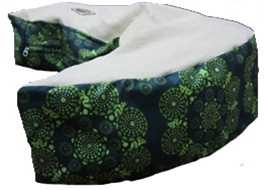 The organic Blessed Nest Nursing/Nesting Pillow answers all of the needs of a nursing mom: comfort, form, function, style, safety, and ethics. 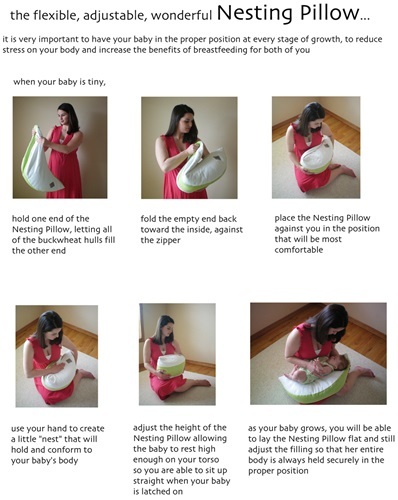 Most nursing pillows provide a surface for you to place your baby on top of while breastfeeding and then you have to hold your baby in place so you don't lose that precious latch. 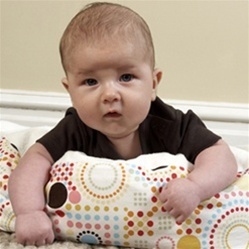 What makes the Nesting Pillow different is that the buckwheat filling allows you to get your baby into the proper position, and then it conforms to baby's body and its weight helps it to stay put. The fantastic advantage of buckwheat hulls is that they move around like a bean-bag and then interlock together like puzzle pieces, giving flexible and stable support whatever size, shape or position you are in. The filling also allows air to circulate. 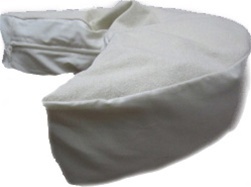 Essentially, this pillow provides stable body support and proper positioning for the infant, making feeding more comfortable for both child and caregiver. 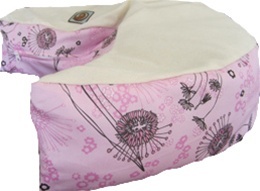 The inside pillow is made of 100% organic cotton* canvas from a US mill. The slipcover is made of organic cotton French Terry. Additional slip covers are also available. This pillow is about 30" wide, 16" deep and 5" high. It weighs about 5.5 pounds. -The outer cover is easy to remove and put back on. It is machine washable. Machine wash it in warm water with your regular laundry and dry it on a medium to high setting. -The inside pillow can be spot cleaned and thrown in the dryer for about 15 minutes to keep it sanitized and free of dust mites. Because the hull of the buckwheat is used, there is nothing in it that attracts insects or promotes mildew. It is important to air-dry the pillow insert before replacing the slipcover. If it does become wet, the cotton canvas and the loose inside filling help air to circulate. All Blessed Nest Pillows are handmade in Blessed Nest’s Kansas green studio under strict supervision and fair labor practices. I am a nursing mother with serious back problems since 2009. I used a generic pillow with my first child and started using the same pillow when my second child was born. I always had a hard time getting in position, a proper latch and I was never able to get the child to my breast, it was always my breast to the child! With my second child, I was starting to have too much pain during nursing times. I searched for a more ergonomic pillow. When I got the Blessed Nest, I started using it right away and I was able to put my baby straight to my breast without hunching my back and trying to push all sorts of pillows to cradle him! I use it all the time and the shape and stuffing is the solution to nursing with ease when you have back problems! The only thing I would mention is that the pillow is much heavier than its polyester counterparts, so you need some getting used to. However, I am absolutely in love with the fact that it's made in the USA and that it's totally organic! This is a wonderful pillow. The height is ideal for my long torso and comfortably brings baby up to my breast. I like that the pillow is firm and supportive of my baby's weight. Both these things mean that I don't need to lift the pillow and baby up - which is what I was doing before - not fun! I also like that I can shape the pillow to help support my baby. I like to punch a little dip for her shoulders and it's great that I can do this for her no matter what side she is feeding on. Before this, I had resigned myself to side lying position to nurse which meant I always had to lie down on my bed but now I can nurse sitting up and around the home - hurrah! Many thanks to Lili for her wonderful support and customer service. I really appreciate the care and time she took to help me find what I needed. Thank you Lili! Worth its weight in gold! I can't recommend this pillow highly enough – it's turned out to be one of my favourite baby gear purchases. I use it several times a day with my newborn, not only for nursing but for tummy time and sitting him up to burp. It's beautifully designed and made, and most importantly, eco-friendly. 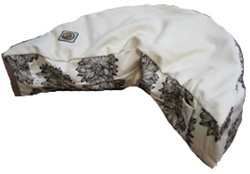 I researched nursing pillows extensively and this product got by far the best reviews. Expensive but good value given its multifunctionality. I expect to be using it for years to come! Big thanks to Lili at My Little Green Shop for her fantastic customer service! This pillow is one of my favorite and most-used baby items. I've owned two other nursing pillows, which were both fine, but this pillow has exceeded all my expectations. The Blessed Nest is supportive and mouldable. No inconvenient straps or uncomfortable shapes here - just a great quality product with an outstanding design. My Little Green Shop also went above and beyond with my purchase. The customer service was friendly and helpful, and they made sure I got exactly what I wanted. Thank you so much!